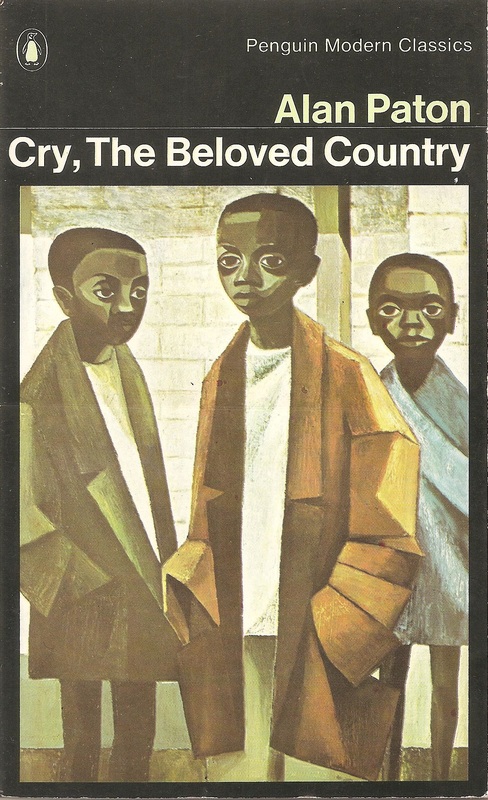 I can think of no other novel in years that has struck me so forcefully as Cry, the beloved country, by Alan Paton. The book was first published in the UK in 1948 by Jonathan Cape; issued as a Penguin Modern Classic in 1958, and subsequently reprinted almost every year until at least 1982, the year in which my copy was printed. Paton was an educationalist, and campaigner for the rights of the native South African population. He was also a friend of Geoffrey Clayton, archbishop of Cape Town, whose biography he published in 1973. Why am I so struck by it ? Fundamentally it is because the plot has an intense humanity, intertwining themes of place and home, familial loyalty and parental loss, individual moral responsibility and racial injustice. Part of its achievement is that the novel presents the full range of thought and feeling about the ‘native question’, but is not subsumed by it, as political novels sometimes are. The Penguin Modern Classics edition, with a cover design by Germano Facetti from an original by Marianne Podlashuc. What is also surprising to a modern reader is the style. To readers accustomed to a prosodic palette of Orwellian plainness and the crispness of Evelyn Waugh, Paton’s elevation of style is reminiscent of the fiction of the nineteenth century and seems somehow marooned, out of time. Yet it achieves this heightened registration without pomposity; the elevation of the sentiment is always brought low by the brute tragedy of the matter at hand. And this height is achieved by means which are fast becoming inaccessible to modern readers, in that Paton draws freely not only on explicit Biblical images, but also on the rhythm of Biblical prose. In this, the narrator takes on the voice of the preacher, although this kind of preaching is in eclipse in the modern churches. The plot centres on Kumalo, a black Anglican priest from the country who comes to Johannesburg in search of his son who (it transpires) has been involved in a botched burglary that resulted in the shooting dead of a white man. The dead man, Arthur Jarvis, was himself a vigorous supporter of change in the lot of the black majority, and an active and young Anglican layman. Kumalo is at the Mission House in Johannesburg when the news breaks, at which point it is not known that it is his son who is the culprit, only that Jarvis grew up in the same part of the country as Kumalo. The reader is told very little of Father Vincent, ‘the rosy-cheeked priest’ of the Mission House who was also there, save for that he is from England. The two had been talking of their respective homes in the countryside: the white man of ‘the hedges and the fields, and Westminster Abbey, and the great cathedrals up and down the land.’ (p.65) After it becomes clear that Kumalo’s son is under arrest, Father Vincent promises whatever aid he can give. It is Father Vincent who marries Absalom Kumalo and the girl who carries his child in the chapel of his prison as he awaits execution, in order to secure the future of the girl and her child, the senior Kumalo’s grandchild. The words of the service are those of the Book of Common Prayer. In the hands of another novelist the scene might be desperate, even horrific; but in Paton’s handling it emerges as dignified, as the couple promise to be faithful for better, for worse, til death should part them.